Novelist Thomas King takes on non-fiction with The Inconvenient Indian, a short but sweeping introduction to the fate of Native peoples in North America since the arrival of European colonizers. Although he is not a historian, King has a broad knowledge of the issues, and has lived all over the United States and Canada, enabling him to provide relevant examples from both countries. And if Canadians have any illusions that we have treated First Nations better than the United States has treated the Native Americans, they will be sorely disabused of this notion by King’s chronicle of broken promises. King’s work is an informal account rather than an academic history, and his approach involves a healthy dose of humour. When I was still settling into the book, King’s first few jokes seemed a bit flip given the seriousness of the subject matter, but as I became more comfortable with King’s style, I realized that the humour was an essential part of his way of dealing with just how dark this history is. In fact, it is this disarming humour which may give King’s book the ability to break down the barrier around white Canada’s ignorance about First Nation’s history. The history he is recounting is enough to make you sick and angry by turns, so a little bit of humour really helps you keep going and take it all in. Defender Craig Kielburger compared it to the humourous approaches used by Rick Mercer and Jon Stewart for raising awareness of current events. The litany of abuses King covers provides a very clear idea of why First Nations and Native Americans might be distrustful of government efforts to improve their current situation. Funnily enough, every time an old treaty or agreement is thrown out in favour of a newer, supposedly better one, Native peoples end up with less land than they had going in. While the general public seems to feel that Native peoples have gotten something for nothing with any treaty arrangement, King is not one to mince words when he calls this idea “horseshit.” King points out that Native peoples have actually learned to look the government gift horse in the mouth, because so often it is full of “humanitarian paternalism” that ends up doing more harm than good. It is a curious cognitive dissonance that allows most North Americans to appreciate the necessity of preserving undeveloped lands in National Parks, but simultaneously views undeveloped Native lands as a waste, or a clear indication that Native peoples don’t know how to use what they have. Indeed, land is at the crux of King’s understanding of White-Native relations, and The Inconvenient Indian is in part an enumeration of the many excuses and methods by which the government has separated Native peoples from their lands. Land and sovereignty over it emerge as crucial issues for First Nations going forward. While King is primary looking back at what has already happened, understanding these issues is also crucial to moving forward. Continuing natural resource development alone will ensure that preventing encroachment is a constant battle. On the second day of Canada Reads 2015, activist Craig Kielburger resumed his enthusiastic defense of King’s anti-history, arguing that it should be taught in every high school history class in Canada because it is an accessible book that will help Canadians understand the issues facing First Nations people in our country. The day two debate questions addressed each of the books in turn, delving into the merits of subtle versus explicit works, and interrogating the currency and effectiveness of each title for breaking barriers. 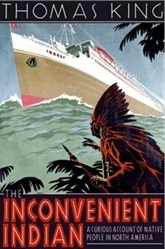 Martha Wainwright went on the offensive, arguing that the humour in The Inconvenient Indian did not necessarily help the book, and that it covered too many events too broadly, rather than going into any detail. Elaine Lui backed this argument, stating that readers might not bother with the book because it was too glib. Interestingly, while Lui felt that King’s humour was potentially alienating, she rejected the idea that the graphic language in her own selection might be similar off-putting for some readers. Kristin Kreuk dissented, tapping The Inconvenient Indian as the title that helped her learn and grow the most. Although they battled hard over the merits of their own titles, Lui and Wainwright once again voted together at the end, eliminating The Inconvenient Indian from contention. Each of the remaining books received a single vote from the other panelists. In a telling exchange at the very end of the debate, host Wab Kinew gave to final word to free agent Kristin Kreuk, whose title Intolerable was eliminated yesterday. Martha Wainwright interjected to say that she didn’t feel that The Inconvenient Indian could be compared to the other books, though as Kreuk pointed out, that is indeed the purpose of Canada Reads. Just before this exchange, Cameron Bailey referenced last year’s winning book, The Orenda, which also addressed First Nations issues, but in the form of a novel. He felt that connecting with the characters provided that book with more depth than The Inconvenient Indian, and that The Orenda stayed with him more as a result. With the elimination of Intolerable and The Inconvenient Indian, all of the non-fiction titles have been taken out of contention, suggesting that this year’s panel connects more strongly to fictional works.